Last year's winners were Appleby. We have expanded the Facebook competition to include all other forms of social media: Twitter, Instagram etc. 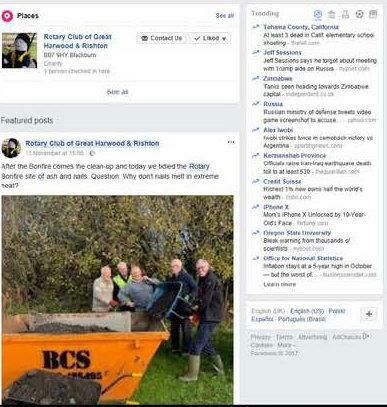 A competition for the Best Club Facebook page that helps to promote Rotary. This is for public pages. Good and accurate use of Rotary roundel. All are eligible to enter, and have an equal chance of winning the District 1190 Club Facebook/social media Competition, with the trophy being presented at the District Conference in Grange over Sands. an email for contact if necessary. Each page will be judged several times from December 2018 to February 2019. If your club uses the various forms of social media platforms, please register your entry with Ian McTurk, Chairman of the District Membership & PI Team by 11th December 2018. Entries close 31st January 2019. NOTE: The winning entry will be offered a 5 min presentation slot at the District Conference on 23rd March at Grange over Sands.